In the 2001 movie Cats and Dogs, the storyline took as its theme the constant war between the beloved, obedient dog and the curious, manipulative cat. Which was better and which would win? 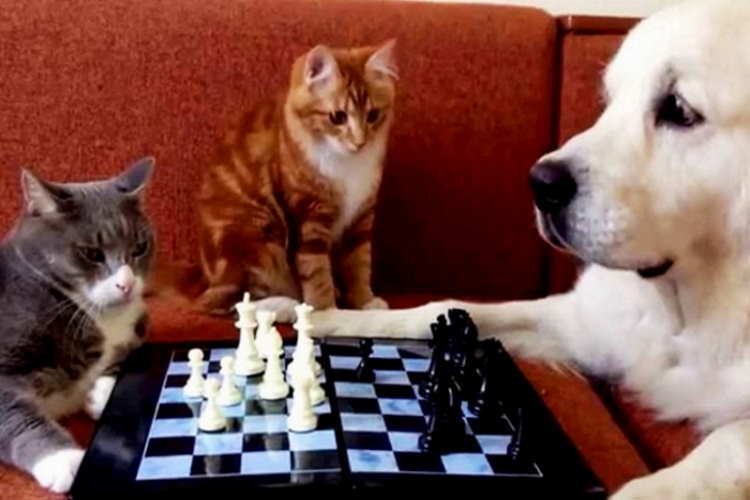 In the real world that war continues to wage on between cat owners and dog owners. But now the battleground is in the field of intelligence and one side is using science to claim their pet is better than the other. "Intelligence is based on how efficient a species became at doing the things they need to survive,"
Based on the evolutionary measurement it would seem that cats would come out on top. In the process of domestication, dogs have come to rely on humans so much more than cats. Because of this, it could be suggested that cats would survive better on their own than dogs. But does that really suggest intelligence? It depends how serious you take Darwin. There are other factors to consider when trying determining intelligence in animals. Some suggest the being social is a mark of intelligence. Humans evolved because of the fact we learned to socialize as did chimpanzees and orangutans. It is said that dogs are more social than cats and their intelligence suggests they will do more for their owners to aid in that socialization. Dogs love to please and obey. In order to obey they have to follow instruction and problem solve. This allows intelligence to grow and develop. That is what makes them such good pets and working dogs. As many have observed you rarely find working cats in terms of police dogs, rescue dogs, and dogs for the blind. You cannot imagine a cat leading a blind person unless that person liked the idea of being dragged through back gardens. Of course, cats have been used for centuries to rid dwellings of mice but it is not the same. Cats are solitary creatures and so their intelligence has altered little since humans first domesticated them in Egyptian times. It has been suggested that cats can, in fact, be trained just as dogs are. Some cat owners have successfully taught their cat to use the toilet rather than a litter tray and some have taught their cats to perform tricks. The difference is that dogs choose to please their owners while cats just please themselves. If it's not beneficial to them, they will not do it. The often traditional and scientific way to measure intelligence in animals is brain size in relation to body mass. This is called the Encephalization Quotient or EQ for short. EQ puts humans at the top of the scale but in terms of our beloved pets, dogs fare better having similar intelligence to elephants. Cats come below the dog. Some would say that these ways of measuring intelligence are to some extent a bit flawed though there is some reasoning to their methods. However recent studies, more scientific, may have settled the debate once and for all. Finally, there is an answer. The answer comes from neurology and rather than measuring the size of the brain scientists count how many neurons the animal has. Suzana Herculano-Houzel explains that the process involves first making a brain soup out of the crinkly surface layer that covers the brain, commonly known as the cerebral cortex. From this mix, she can then determine how many neurons that brain would have. Neurons are important in brain function and intelligence for they are like the circuits in a computer. The more circuits (or buses) a microchip possesses the more powerful and faster the computer. The brain works in much the same way. The greater the neurons the greater the intelligence or brain power. In her experiments, Herculano-Houzel used brains from two dogs, one large, one small and a brain for a cat. The reason for the two dog brains was because dogs come in many sizes and so it was thought best to take samples from a small and large dog. That isn't the case with cats so only one sufficed. 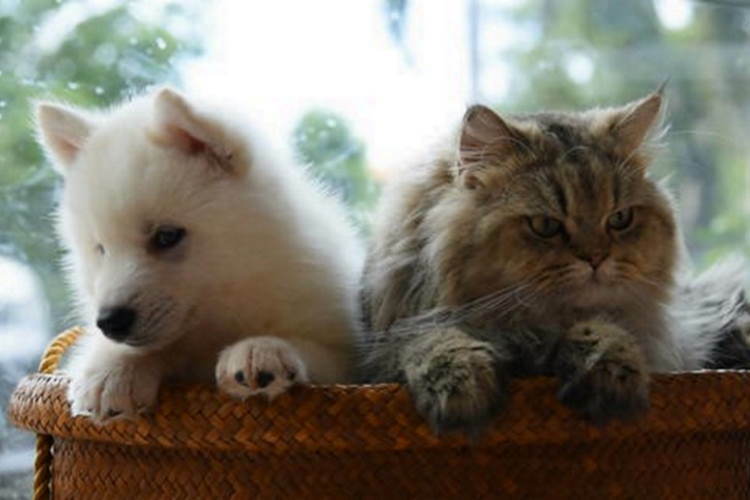 Tests pointed to the possibility that dogs have 500 million neurons which were double the cats 250 million neurons. This suggests then that dogs have the greater capacity for intelligence. To put all this into context the human brain has on average 16 billion neurons so both dogs and cats have a long way to go before they could take over the world. It is surprising when comparing brain size studies with the counting of neurons. As previously mentioned, according to the EQ, dogs are said to have a similar intelligence to elephants. However, the studies with neurons put the elephant at 5.6 billion which is a considerable leap from the dog. It is said they need so many to deal with motor skills, not just intelligence. How does this science translate into real life? In our experience with our cats and dogs who seems the more intelligent. Most of us would have met a stupid dog or a dumb cat just as we have with some of the people we meet. The question remains, can counting neurons or brain size be a sure way of determining intelligence? Surely it is only by putting the entire studies together can we get a true measurement. Going on survival the cat is superior, socially the dog in the better animal. Cats, however, are curious creatures and that curiosity is a capacity to learn. Dogs do not possess this nature to the same extent. So who wins? If one were to add up the studies with the neuron aspect then dogs would still come out on top. They do not stand to lose their title as man's best friend anytime soon. But this will not stop the debate as at the end of the day it all becomes subjective. The only people who will determine the intelligence of their pet are the owners themselves and so the war goes on. Intelligence is a great factor in determining how a species grows but, to be honest humans haven't used theirs all too well. Our capacity to be mindless continues on as we sink to greater depths of depravity. Ritely believes the question should not be who has the greatest intelligence but who uses it better. In the film mentioned at the beginning of this piece, the cats used their intelligence for evil, the dogs for good. That is the true measurement and one all species need to be counted by. Mary Seddon is a North Carolina-based freelance writer and work-from-home for Ritely.com and mother of two. In her 10 years as a professional writer, she’s worked in proposal management, grant writing, and content creation. Personally, she’s passionate about teaching her family how to stay safe, secure and action-ready in the event of a disaster or emergency.